Today's Extra Dark 80 percent Venezuelan Dark Chocolate bar was from Barlovento Chocolates (Oakland, CA). 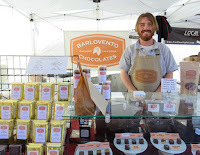 Barlovento offers chocolates bars and confections "with a farmers market aesthetic" that are made from single source 100 percent cacao, from one region of Venezuela. 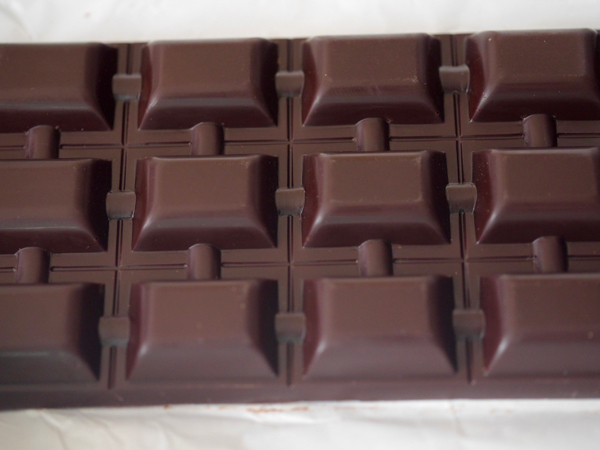 Inclusions include herbs and fruit that one might find in the (Oakland) farmers market where I bought this bar. 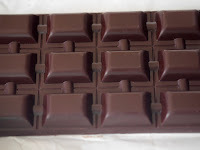 For an ultra-dark bar, this chocolate was very smooth and pleasing, full of fruit aroma and flavor. It also had lower acid, astringency and/or bitterness than you might imagine for an 80 percent bar. 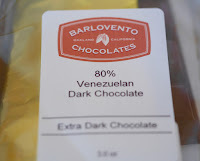 This extra dark bar had a pleasant, sweet, almost spicy, dark chocolate aroma with light dried fruit notes (ranging from cherries and figs to pears and apples). However, again, this subtle 80 percent bar wasn't as rambunctious as it sounds. All these flavors/flavor notes were all very well balanced.